Context: Musculoskeletal pain is common among tea leaf pluckers and is attributed to the load they carry, long working hours, the terrain, and insufficient job rotations. As a result of this, their health and work capacity are affected. Aims: To assess the prevalence, patterns, and factors associated with work-related musculoskeletal disorders (WRMDs) among pluckers in a tea plantation in Annamalai, Tamil Nadu, India. Settings and Design: This cross-sectional study surveyed 195 pluckers selected by simple random sampling aged between 18 years and 60 years. Materials and Methods: The interview schedule had four parts––sociodemographic detail, Standard Nordic Scale, numeric and facial pain rating tool, and a tool to assess factors associated with WRMDs. Statistical Analysis Used: Statistical Package for the Social Sciences (SPSS) version 16. Results: Prevalence of musculoskeletal pain in the last 12 months and the last 7 days was 83.6% and 78.5%, respectively. The most common site for last 1 year was shoulder (59%) and for last 7 days was the lower back (52.8%). 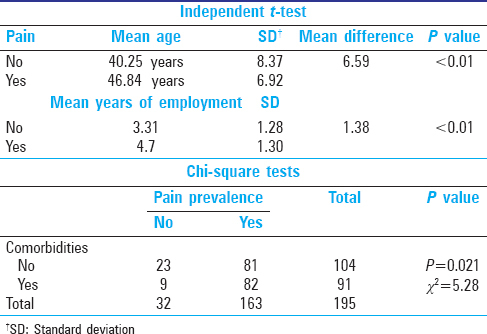 Independent t-test revealed that the mean age of those with pain was 6.59 year more and mean years of employment was 1.38 years more among the workers with pain compared to workers without pain. Increasing morbidities among workers was also significantly associated with an increase in WRMDs on Chi-square test. Conclusions: The prevalence of musculoskeletal pain was high among tea pluckers and the most common site during the last 12 months and the last 7 days was the shoulder and lower back respectively was mild in character. Increase in age and duration of employment was associated with WRMDs. Globally, musculoskeletal disorders (MSDs) are responsible for individual, social, and work-related burdens in terms of distress, disability, and quality. Females constitute a majority of tea plantation pluckers. The work is performed in a traditional way without much awareness about its impact on health. Due to this backbreaking and drudgery-prone work, the output of the work decreases and the health of the pluckers is also affected. In India, 70% of the labor force is employed in the agriculture sector. Plantations are considered to be a part of agricultural sector and employ more than 2 million workers in our country. India's tea plantations are largely grouped into two regions––North East India and South India. Tamil Nadu and Kerala are important southern states involved in tea production. According to the Occupational Health Safety Associations (OSHA), work-related musculoskeletal disorders (WRMDs) is defined as the disorders of muscles, skeleton, and related tissue, which have been empirically shown or suspected to have been caused by workplace activity. Standard Nordic Questionnaire (SNQ) is a tool used to assess the prevalence and pattern of WRMDs. This questionnaire is used in several occupational settings such as secondary school female teachers, bus drivers, farmers , tea plantation workers, and palm plantation workers. Musculoskeletal symptoms in tea plantation workers is mainly due to the carrying of heavy load, long duration of work, and insufficient job rotations among the workers. Musculoskeletal symptoms on any one or more body regions may interfere with normal working, subjects seeking professional treatment, or the need for hospitalization. The objectives of this study were to estimate the prevalence and patterns of WRMDs and to document factors associated with WRMSDs. This study was a cross-sectional study conducted in a tea plantation situated in Annamalai, Tamil Nadu, India. This study was conducted between June 2014 and August 2014. Ethical approval for this study was obtained from the institutional ethical committee and informed consent was taken from the plantation management as well as from the study subjects. The total population on the estate including dependents was 2,916 as per the company census 2013. The total working population in the estate excluding the managerial and assisting staff was 1,244. The sample size was calculated with 95% confidence interval and relative precision of 10%. All the tea plantation pluckers of the estate aged between 18 years and 60 years were considered to be the sampling unit. Lists of all the pluckers were obtained and among them, 195 pluckers were chosen by computer-generated random numbers and were interviewed. The workers who were not available or did not give consent to be a part of the study were replaced by the next person in the list. The interview schedule had four parts––sociodemographic details of the workers, Standard Nordic Scale to assess pain in different parts of the body for the last 1 year and in the past 7 days, numeric and facial pain rating tool to assess its severity, and a tool to assess factors associated with WRMDs. Nordic questionnaire is a standardized questionnaire for assessing musculoskeletal pain. It has a sensitivity of 82.3–100 and specificity of 51.1–82.4. It assesses ache/pain/discomfort in nine different regions of the body for a duration of 1 year and the past 7 days and also whether the pain has affected work in the last 12 months. It also further describes about the consequences of pain in the neck, shoulder, and lower back. The facial and numeric rating pain scales are subjective scale in which the pain will be rated from 0 to 10 as mild, moderate, and severe. The participant will rate the pain in the numeric rating scale , whereas in the facial rating scale  the investigator will rate the pain based on the facial expression of the participant on palpating the tender area. Age of the person, number of years employed, average hours of plucking per day, methods of plucking, and average unloading weight were the factors, which were considered to be possibly associated with WRMDs. The data were coded and entered in Microsoft Excel and analyzed using Statistical Package for the Social Sciences (SPSS) version 16. Data were checked for normality using Shapiro-Wilk test. The demographic data were analyzed using frequencies, means, medians, and standard deviations. The prevalence and other factors were analyzed using frequencies. Independent t-test was used to find the mean difference of mean age and years of employment with WRMDs. For the independent variables, which were categorical Chi-square test was performed. A P value of <0.05 was considered to be significant for all analyses. Nearly 70 (40%) workers were illiterate. The primary source of income for pluckers was the monthly wage and 26 (13.3%) had additional income by working in petty occupations such as housemaids and working on holidays. The mean age of the study population was 45.6 [standard deviation (SD) ±7.56] years and average body mass index (BMI) was 22.1 (SD ± 3.77). The mean income of the workers was '8891.50 (SD ± 2.598). 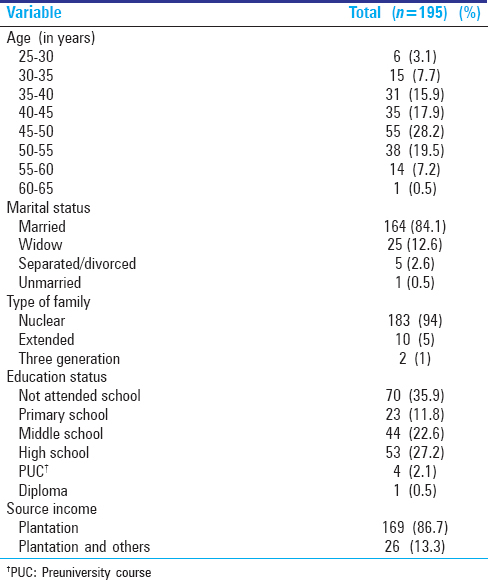 Majority of them were married––164 (84.1%) and belonged to nuclear family––183 (94%) [Table 1]. The prevalence of WRMSDs for the last 12 months and 7 days was 83.6% and 78.5%, respectively. The region-specific prevalence of 12-month and 7-day musculoskeletal symptoms is shown in [Table 2]. Among those with musculoskeletal symptoms in the last 12 months, a highest prevalence was seen in the shoulder followed by the lower back and neck. Among those with musculoskeletal symptoms in the last 7 days, highest prevalence was seen in the lower back followed by the shoulder and neck. A majority of the workers, i.e., 194 (99.5%) had seen the doctor for neck pain and lower back pain; among them 15 (7.4%) were hospitalized for lower back pain. Among those with shoulder pain, 8 (4.1%) had to change jobs [Table 3]. 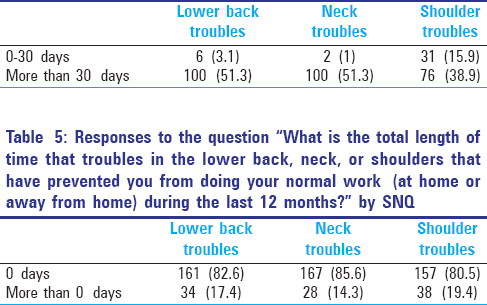 Duration of pain for less than 1 month was more in the shoulders, i.e., in 31 (15.5%) workers and pain for more than 1 month was more in the lower back and neck, i.e., in 100 (51.3%) workers [Table 4]. [Table 5] explains interference of pain in doing normal work; 34 (17.4%), 28 (14.3%), and 38 (19.4%) workers had difficulty in doing their normal work (at home or away from home) due to trouble in their lower back, neck, and shoulder, respectively. The pain was rated mild with respect to the numeric scale as well as by the researcher on the facial rating scale. On performing independent t-test, there was an increase in the mean age by 6.59 years and an increase in the mean years of employment by 1.38 years among the workers having pain compared to the workers without pain and this difference was statistically significant at α = 5% since P value was <0.05. Increase in comorbidities such as posthysterectomy, diabetes, and hypertension among workers was also significantly associated with increase in WRMDs, Chi-square test (χ2 = 5.28, P = 0.021) [Table 6]. MSD is a common problem faced by agricultural workers. In this study, most of the women pluckers were illiterate with a majority of them belonging to the age group of 45–50 years. In this study, the prevalence of WRMDs for the past 12 months was 83.6% compared with 25.9% in the general population of New Delhi, India. This can be attributed to the pattern of work done by the plantation workers compared to the general population. Among palm plantation workers, the prevalence was 93% for the past 12 months  that was similar to our study findings. Studies conducted among different occupations regarding WRMDs, the prevalence of lower back pain in commercial vehicle drivers in Malaysia  and professional bus drivers in Israel  was 60.4% and 45.4%, respectively. Similarly, the prevalence of WRMDs in Irish farmers  and secondary school teachers  was 56% and 79.17%, respectively. The prevalence of neck pain among rubber tappers in Kerala was 72.2%. This shows that the prevalence of WRMDs in various regions of the body is a common phenomenon and the site of pain depends on the occupation. Among the agricultural practices in general, several studies show the higher prevalence of MSD among farmers compared to other occupation workers. A systematic review done by Osbore et al. showed that the prevalence of MSD was more in farmers compared to nonfarmers and lower back pain was the most common region followed by the upper and lower extremities. 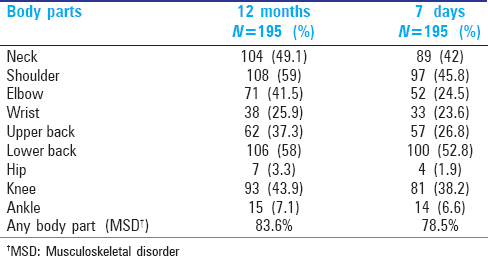 In this study though the overall prevalence WMRD was high, in the past 12 months and 7 days prevalence of pain was highest in the shoulder and lower back, respectively. This was similar to another study conducted in a tea plantation setting in India where the prevalence of pain was highest in the shoulder. Among workers in a palm plantation, the highest prevalence was lower back pain. In a tea plantation, the load of the tea bags hanging from the plucker's head transmits the weight through the neck to the lower back; prolonged bending during plucking can also lead to discomfort in the lower back and continuous plucking for long hours leads to pain in the shoulder region. Usually WRMDs result in reduced work activity. In our study, most of the workers had reduced work activity due to shoulder trouble (25.6%) compared to another study where it was due to trouble in the neck (7.6%). In the same study, 36.2% of the workers sought professional treatment for WRMD but none were hospitalized; however, among this study population 99.5% of workers had sought the doctor's advice for neck and lower back pain and 7.4% were hospitalized for lower back pain. The prevalence of WRMDs was high when compared to the general population and almost similar to other studies done in parallel settings. The presence of WRMDs leads to decreased productivity of the estate. The pain was more among middle-aged workers and in the workers who had worked for a longer duration. This study was conducted in the plantation in which no active medical intervention was done to tackle WRMDs. Hence, the management can plan for interventions by providing breaks and reducing the weight of tea leaves carried by the women. Other interventions in the form of physiotherapy and exercise sessions in the estate hospital and dispensaries can be done. Brief warm-up exercises before starting work can also be encouraged. This may result in improvement of the symptoms and the general health among workers. Socioeconomic condition among women workers in plantation industry; 2008-2009; a report by Government of India, Ministry of Labour and Employment, Labour Bureau, Chandigarh. KRPCDS Report on tea plantation worker. Available from: . [Last accessed on 2014 Feb 14]. Work-related musculoskeletal disorders: Prevention report. Available from: . [Last accessed on 2014 Dec 5]. Alperovitch-Najenson D, Santo Y, Masharawi Y, Katz-Leurer M, Ushvaev D, Kalichman L. Low back pain among professional bus drivers: Ergonomic and occupational-psychosocial risk factors. Isr Med Assoc J 2010;12:26-31. Osborne A, Blake C, McNamara J, Meredith D, Phelan J, Cunningham C. Musculoskeletal disorders among Irish farmers. Occup Med (Lond) 2010;60:598-603. Dihingia PC, Dewangan KN. Musculoskeletal symptoms among tea pluckers in India. Indian J of Occupational and Environmental Medicine 2012;10:69-81. Yee Guan NG, Tamrin SB, Yik WM, Yusoff IS, Mori I. The prevalence of musculoskeletal disorder and association with productivity loss: A preliminary study among labour investing manual harvesting activities in palm oil plantations. Ind Health 2014;52:78-85. Kuorinka I, Jonsson B, Kilbom A, Vinterberg H, Biering-Sørensen F, Andersson G, et al. Standardised Nordic questionnaires for the analysis of musculoskeletal symptoms. Appl Ergon 1987;18.3:233-7. McCaffery M, Pasero C. Pain Clinical Manual. St. Louis: 1999. p. 16. Wong DL, Hackenberry-Eaton M, Wilson D, Winkelstein ML, Schwartz P. Wong's Essentials of Pediatric Nursing. St. Louis; 2001. p. 1301. Reddy VD, Kumar BS, Uzma N. Lung function parameters, neck pain and associated factors among male rubber tapping workers in Kerala. Int J Pharm Med and Bio Sc 2012;1:43-8. Osbore A, Blake C, Fullen BM, Meredith D, Phelan J, McNamara J, et al. Prevalence of musculoskeletal disorders among farmers: A systematic review. Am J Ind Med 2012;55:143-58.